Welcome to A Sampling Bee! 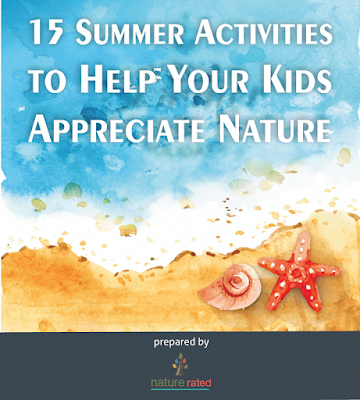 Today, I have teamed up with Joe from Nature Rated to bring you 15 Summer Activities to Help Your Kids Appreciate Nature. Read below and check out the cute activities that you can do with your kiddos this summer! What are your kids doing this Summer? For many of us Summer time with the kids is a time to enjoy the outdoors, the sunshine and if you're lucky the ocean. 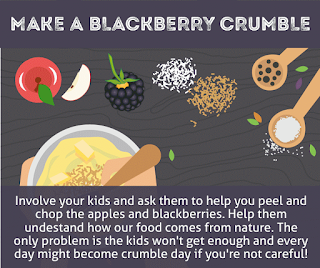 As much as kids love Summer holidays, keeping them busy can be a real chore! If you've not got the luxury of a Summer camp then it's up to you as parent to find things for the youngsters to keep busy with. Failing that, your kids might spend all their time in front of a computer, tablet, phone or other screen and research has shown that spending too much time in front of a screen can have a detrimental effect on the health and wellbeing of children. Studies have shown that taking part in nature-based activities helps people who are suffering from mental ill-health and can contribute to a reduction in levels of anxiety, stress, and depression. In fact, a daily walk in nature has showed decreased activity in a region of the brain associated with a key factor in depression. I hope you enjoy creating these activities with your kiddos! I plan on making the Nature Table with my boys! Be sure to follow Nature Rated for more fun activities. Please share your creations with us! These are all such great ideas! I totally need to make a summer activity list for my kids. Lovely tips! I need to incorporate these since my daughter loves playing on her kindle fire. I agree with you so much that kids need more opportunities to connect with nature. Some of my kid's favorite memories is going hiking and exploring doing "nothing" but discovering nature. Have a fun summer! One of our activities every summer is going in a beach. My kids loves swimming so we do this every summer. It is so nice to expose the kids to the great outdoors and just do things with them during the summer instead of having them sit in front of the TV all day! These are great tips, to be honest! I think it is so important that we spend more time outside especially our kids. Our bodies are not designed to be indoors all day looking at screens and sitting. I definitely agree that in some cases just time outside could really have a lot mental health benefits for those that feel depressed. These are great ideas to get the kiddos outside. Summer can be tough. We need more activities to keep our little one entertained. It has been raining all week and we have been stuck inside. My son is only 2 years old but he already know how to appreciate nature! He loves summer as much as he loves the rain! I have always encouraged my kids to have outdoor play. To motivate them more, I go bike riding with them. It not only gives them fresh air, it also helps strengthen their muscles and bones.